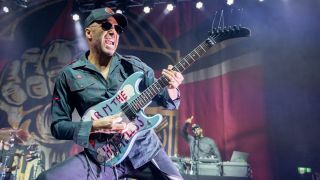 Tom Morello: "The idea was to fight back against this world of radio with no electric guitar anymore"
When Tom Morello last spoke to MusicRadar for World Guitar Day, he expressed no doubt whatsoever on whether the instrument was still able to break socio-political boundaries, like it did when Rage Against The Machine exploded onto LA’s music scene with their 1992 self-titled debut. And he should know. His latest litmus test, titled The Atlas Underground, takes his guitar far from its usual confines into the very deepest end of crossover - roping in an all-star cast of names across a wide net of music. First single We Don't Need You featured rapper Vic Mensa and was followed by Rabbit’s Revenge, with American DJ Bassnectar, Outkast legend Big Boi and Run The Jewels rapper Killer Mike in tow. Elsewhere on the album are artists like Skrillex, Marcus Mumford of Mumford and Sons, Gary Clark Jr. and K.Flay - a brilliantly bonkers list of characters that are rarely mentioned in the same breath. What exactly does The Atlas Underground stand for? Gary Clark Jr is one of the most exciting blues players around. What was he like to work with? “I’ve run into Gary at various shows, hotels and backstages through the years. It was a real pleasure spending a day with him and getting to know him as a player. We spent a lot of time jamming with a rhythm section, doing this old-school trade of licks back and forth for hours, having a blast. We started throwing lyrics back and forth, utilising his incredible and emotional vocal style, recording a ton of music. “Blues is the seed of rock ’n’ roll. It was the original spark of self-expression and personal inquiry, which then led to the blues players like Gary we hear today. It also came through the British bands, from The Beatles to The Stones to Zeppelin, and took on an entirely new context. Then it went through the punk-rock wringer. How different did it feel to your work in Prophets Of Rage, who you’ve also been busy with? “For this, my job was not just songwriter/guitar player, but also curator. I wanted to get artists from all kinds of genres and create this powerful and cohesive artistic statement. I wanted to fold all of these other artists into the conspiracy of The Atlas Underground, finding thematic and sonic commonalities between songs with singers from different words. “The ambition is to do just that - not speaking exclusively in guitar terms, because Hendrix was more than that in my view. He was a songwriter, with of course extraordinary guitar skills and flamboyant originality - elements I’ve tried to insert into my own music - but he was a songwriter first. And that’s something special. A lot of guitar guys think shred first, song never! What is the song you most want to be remembered for? Your rig has stayed pretty consistent throughout your career. What was the general signal path on this album? “Yup, my principal setup has remained the same 1988! It’s my Arm The Homeless guitar with the hippos on it, my Marshall JCM800 2205 50-watt head through my Peavey 4X12 cabinet. The effects are the original DigiTech Whammy pedal, a Cry Baby wah-wah, a digital delay that I think is probably the Boss one, an EQ pedal I use exclusively for a boost and that’s about it. Those are the primary arrows in the quiver! For the songs in drop D, I used the old 1982 Telecaster, the Sendero Luminoso one I’ve been using for years. The Atlas Underground is out on 12 October via BMG, and available to preorder now.